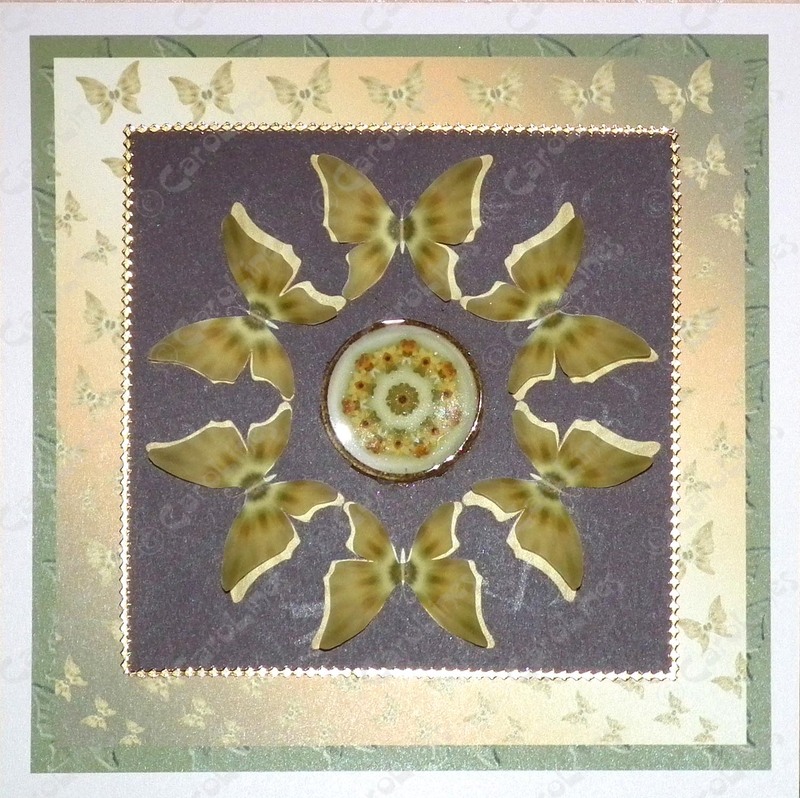 This card uses Rainbow Butterflies set 1. 1: Create a cream coloured square approx. 13 cm x 13 cm in your graphics programme. 2: Import the embossed paper, re-size and position it over the cream square so there is a small border. 3: Import the swirling butterflies paper, re-size and place over the embossed paper. 4: Create a plain brown square and position this over the butterfly paper, leaving about a 1 cm border. 5: Group the design together. Import and position the button in the centre of the brown square. 6: Put to the side bar or save. 7: Import the butterfly, re-size and copy, paste and rotate each by 60 degrees so there are 6. 8: Arrange them as illustrated, group and then position them around the button. on to vellum. Print just the button on to card. 9: Cut each butterfly out removing the antennae (too fiddly!). 10: Glue just the butterfly body over those on the card. When the glue is dry fold the wings upwards. with dssp so it is raised from the card.